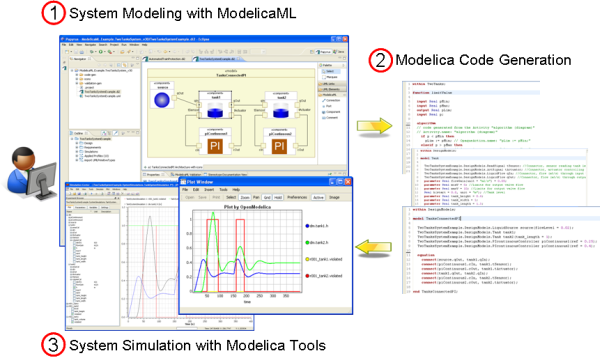 Modelica Modeling Language (ModelicaML) is a graphical modeling language for the description of time-continuous and time-discrete/event-based system dynamics. ModelicaML is defined as an extended subset of the OMG Unified Modeling Language (UML). This subset enables the generation of executable Modelica code. 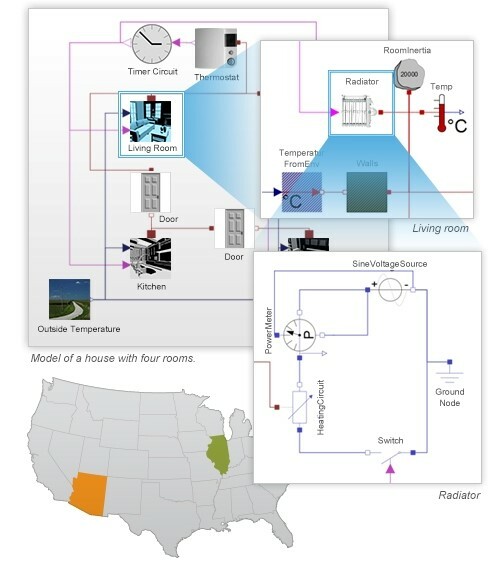 ModelicaML extends the graphical modeling capabilities of Modelica by providing more diagrams (UML diagrams for presenting the composition, connection, inheritance or behavior of classes) for graphical model definition or documentation. Moreover, ModelicaML supports a method for formalizing and evaluating system requirements using simulations. Schamai, Wladimir. Modelica Modeling Language (ModelicaML): A UML Profile for Modelica. Technical Report. Linköping University Electronic Press, 2009. Schamai, Wladimir, Peter Fritzson, Chris Paredis, and Adrian Pop. "Towards Unified System Modeling and Simulation with ModelicaML: Modeling of Executable Behavior Using Graphical Notations." In Proceedings 7th Modelica Conference. Como, 2009. Schamai, Wladimir, Uwe Pohlmann, Peter Fritzson, Chris Paredis, Philipp Helle, and Carsten Strobel. "Execution of UML State Machines Using Modelica." In 3rd International Workshop on Equation-Based Object-Oriented Modeling Languages and Tools (EOOLT), vol. 47, 1-10. 2010. Schamai, Wladimir, Philipp Helle, Peter Fritzson, and Chris Paredis. "Virtual Verification of System Designs against System Requirements." In Models in Software Engineering, 75-89. Springer Berlin Heidelberg, 2011. Schamai, Wladimir, Peter Fritzson, Chris Paredis, and Philipp Helle. "ModelicaML Value Bindings for Automated Model Composition." In Proceedings of the 2012 Symposium on Theory of Modeling and Simulation-DEVS Integrative M&S Symposium, edited by Society for Computer Simulation International. 2012. Schamai, Wladimir, Peter Fritzson, and Chris Paredis. "Translation of UML State Machines to Modelica: Handling Semantic Issues." In SIMULATION, 498 - 512. 2013. Schamai, Wladimir, Audrey Jardin, and Daniel Bouskela. Industrial Use Cases for Requirements Verification and Model Composition in ModelicaML. Presentation, Linköping, Sweden: 7th MODPROD Workshop on Model-Based Product Development, 2013. Schamai Wladimir. Model-Based Verification of Dynamic System Behavior against Requirements : Method, Language, and Tool. [Thesis]. Linköping: Linköping University Electronic Press; 2013. Linköping Studies in Science and Technology. Dissertations, 1547.